⋯ (April 24, 2014) - The Imaging Source Europe GmbH, long-standing partner of MVTec Software GmbH, extends the support and distribution activities in Southern Germany and becomes "MVTec Certified Training Partner". MVTec's distributor The Imaging Source strengthens the support and distribution activities of the machine vision software HALCON with their new sales office in Gernlinden near Munich, Germany. The Imaging Source is now part of the MVTec "Certified Training Partner" program, qualifying the employees to pass on their broad knowledge about the software library HALCON from MVTec to their customers. To receive this certification, selected employees of The Imaging Source have participated in comprehensive trainings by MVTec, thus enabling them to even better support HALCON customers in developing their applications. The Imaging Source offers trainings and seminars for HALCON starting now. HALCON is the market leader among machine vision libraries regarding performance, flexibility, and comprehensiveness of the tools. HALCON fits well with our camera portfolio to offer customers from all machine vision markets an automated solution. Our support and our trainings help customers to choose exactly the right tool from HALCON's variety in order to realize his task most suitably and quickly. 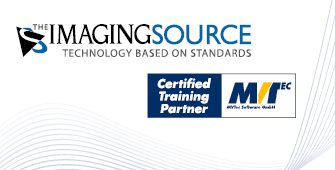 We are very pleased that our long-standing distribution partner The Imaging Source increases the significance for MVTec with the local sales office in Southern Germany and above that further strengthens the portfolio of HALCON services as certified training partner. About MVTec: MVTec is a leading manufacturer of standard software for machine vision. MVTec products are used in all demanding areas of imaging: Semi-conductor industry, web inspection, quality control and inspection applications in general, medicine, 3D vision, and surveillance. MVTec has more than 30 established distributors, located throughout Europe, North and South America, Australia, and Asia (China, Japan, Korea, India et al.). In addition, MVTec, LLC works out of Boston, MA (USA), to better attend the North American market since 2007.